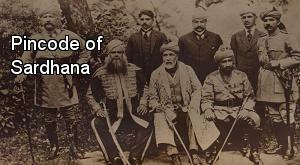 Sardhana is a town and a municipal board in Meerut district in the Indian state of Uttar Pradesh. It is located 85�km (53�mi) northeast of New Delhi, and 13�mi from Meerut. 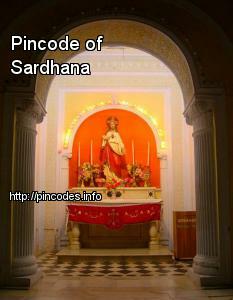 Sardhana is famous for its cloth industry and Church. Being close to Hastinapur, which is also in Meerut district, the capital of Kauravas of Mahabharata, Sardhana is also known for the ancient Mahadev Temple that is believed to be dating from the Mahabharata period. It was here that the Pandavas prayed before leaving for the Lakshagrah, the notorious palace made of lac by Duryodhana, at the confluence of the Hindon and Krishna rivers (Kali River, Kali Nadi). This palace was located at Varnavrat, the present Barnava, where the prince resided with their mother Kunti.